The blasted man will not stop following her. Well, he isn’t following her . . . not exactly. They are just always thrown together, and he is everything she wants but cannot have. It is downright infuriating—especially when he kisses her. Lady Grace Abernathy has been ravished and left pregnant (and thoroughly unsuitable for any honorable gentleman). This would not be such a gargantuan problem if Lord Alexander Hardwicke would simply stay away from her as she asked. But leave it to her meddling Aunt Dorothea—who means well, of course—to continually thrust the two into each other’s company. Against both their wishes. These distractions are almost more than a reasonable lady should be forced to bear, let alone one who is dealing with all the difficulties inherent with both an unwanted pregnancy and a dire lack of a husband. Alex left London to visit his deceased father’s oldest friend, Lord Rotheby, and to get away from his mother and her matchmaking schemes, only to run into more of the same at every turn. Why can he not determine for himself the course his life will take before everyone pushes him to take a wife? 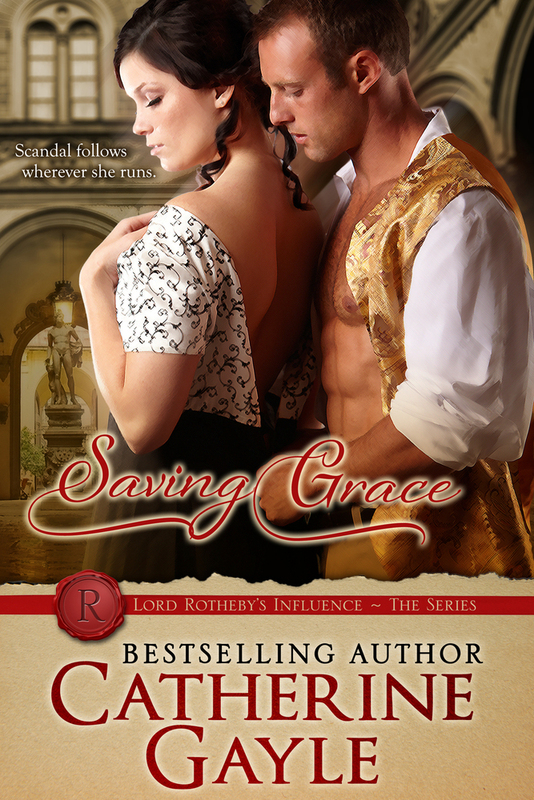 But the more time he spends in the company of Lady Grace, the less he finds himself able to ignore his growing attraction—and his burgeoning need to protect her. Must he cause a scandal in order to protect her from one? Lady Grace Abernathy’s cheek burned where the back of her father’s hand struck her, but she fought to conceal her emotions. How on earth had he learned what had happened? Could someone have hidden in the library and watched while the Earl of Barrow ravished her? Her father, the Marquess of Chatham, rose to full temper. His bulbous head turned an unnatural shade of purple and appeared as though it might burst at any moment. Grace rather thought she might like to see it burst. His eyelids twitched over his wide eyes, and the thin bits of greyed hair covering his scalp flopped back and forth with each syllable. He dropped into the chair behind his aged desk and held his head in his hands. Grace’s jaw dropped when she learned of the extremity of Lord Barrow’s revenge for Father breaking off their agreement. And of course, her father and his drink-addled mind had fallen right into Barrow’s trap, and Grace took the brunt of it. Why should she have expected anything different? His head rose and he stared upon her with apprehension. A pit of ire rose up in her over his dubious expression. Would the man never believe her, not even over this? Of course, everything inevitably rested on status. Father had never concerned himself with her welfare, but only cared about the connections he had within society and the coin lining his coffers. How could he do better than marrying his daughter off to a duke? Grace wouldn’t doubt if there were some sort of monetary agreement involved as well—something which would be more favorable than whatever Lord Barrow had offered, since Father had blatantly ignored the agreement with the Barrow—therefore garnering the earl’s wrath—and leaving Grace to deal with the consequences. Why could Father not, just once, love her? He slumped forward in his chair and wept. She waited, still as could be, to see what he would do next. “Father, you can’t really wish align yourself with a man who would ravish your daughter, can you? And why does the earl leave England so often?” The man’s frequent trips abroad, with no explanation, left her unsettled—even more now that she would be forced to marry him. Something seemed out of place, though she couldn’t quite put her finger on it. Grace ought to have known her father would not enquire into such matters. He preferred to know the title, connections, and property of any of her possible suitors. Anything else held little concern. For that matter, their ages and temperaments caused him no concern at all. Grace would marry as her father ordered her to marry, and that was the end of that. Her preferences, and frankly her needs, carried little moment with him. A throb built in her temples as she waited to learn what else he had to say. Her jaw twitched with a desperate need to scream at the man, but somehow she held her tongue. “For how long, Father?” She glared at him through a haze of red. Of course he would banish her to her chamber again. He always locked her away. “Until I decide you should come out, that is how long!” He sat behind his desk again and poured whiskey into a glass. Grace fled through the doors of his library, blinded by her rage. Was she truly so unlovable her own father would take the side of a jilted suitor over her?